James G. Rickards is a lawyer, economist and investment banker with 35 years of experience on Wall Street. His new book The Death of Money, published by the Penguin Group, is a New York Times bestseller. His first book, Currency Wars, published in 2011, and was also a Times bestseller. In his new book he explores further the consequences of the weak dollar policy pursued by the Federal Reserve Bank, coupled with the huge run up in deficits and debt by the United States, and the failure of Congress and the Obama Administration to devise policies that would spur faster economic growth. Rickards is a portfolio manager at West Shore Group, LLC, Haddonfield, N.J., an investment fund set up in 2013, and an adviser on international economics and financial threats to the Department of Defense and the U.S. intelligence community. He gained first-hand experience on the front lines of a financial crisis as counsel for the hedge fund Long-Term Capital Management, when he was principal negotiator in the 1998 bailout of the fund by the Federal Reserve Bank of New York. Q: Obviously the Federal Reserve and the dollar are at the center of the story in your new book. What are the most important things Washington needs to understand to face the reality of a possible dollar collapse and possibly prevent it? Rickards: Part of the thesis of the book is the fact that the people in charge – meaning the Treasury and the Fed, other central bankers and monetary elites – actually have very limited comprehension, if any, as to how dangerous the situation is. The idea that the elites see the danger and the everyday investor doesn’t – I would stand that on its head. And say it’s beginning to sink in to the everyday investor that there are serious problems and they need to take precautions because the central bankers are driving the bus over the cliff. But they don’t see the cliff. Q: What are the things the people in charge of monetary and dollar policy in Washington least understand? What are they missing? Rickards: Well, they’re missing everything. Let me say what I mean by that. All policy, at least the way it’s done today by central bankers, is based on some paradigm as to how the economy works, some specific models as to how certain functions and factors work within the economy. And if you get your model wrong – worst yet, if you get your paradigm wrong, then your policy is going to be wrong every time. And that is problem. The central bankers are sort of a closed circuit. They all went to the same schools. You could pick five schools. You can say M.I.T. [Massachusetts Institute of Technology], Harvard [University], [University of] Chicago, Stanford [University], and maybe Yale [University] and [the University of California at] Berkeley and maybe throw in a couple of others. And then go around the world and look at all the major central banks and where they went to school. They went to one of those five places. They took the same courses. They had the same professors. In a lot of cases they were each other’s professors. Stan Fisher walked into the Board of Governors having been thesis adviser to some of the other members. So, you have a groupthink problem. They’re using general stochastic equilibrium models, which do not sync into reality. Their paradigm is they have an equilibrium model. There’s some perturbation that throws the economy out of equilibrium. And what you do is apply policy that gets it back to equilibrium and once it gets back to equilibrium the clock starts ticking again and it’s all good. That’s kind of how they think about things. But, in fact, the economy is a complex system. And if you look at complexity theory and I do that in The Death of Money and also in my first book Currency Wars, and I’ve done a lot of research along those lines, you see that what happens in complex systems is they kind of mimic an equilibrium system for awhile and then they just go off on a tangent and there are the so-called black swans. And I don’t really like the phrase black swan because it is amorphous and inexact. But that’s as good a term as any that everyday readers can understand. But the textbook term for that is emergent properties, which means that things just seem to come out of nowhere. There’s nothing about perfect information in the system that would allow you to infer what’s coming next because, as I say, it just kind of pops up out of nowhere. And when it happens it’s an irreversible process. In many cases you can’t make it go back to what it was. And so therefore risk management in a complex system is all about mitigating the scale of the system so that you don’t have these mega-catastrophes in the first place. Whereas in an equilibrium system, if you think that printing money is the right policy to affect equilibrium, you may actually print so much money that you increase the scale of the system and increase the probability of a catastrophic result. So, they’ve got the wrong model. I mean that’s empirical. It’s not just an opinion. You can look at the time series of prices in any market. It’s not normally distributed. It’s a power curve that signifies a complex dynamic underneath. And if you dig deeply, that’s exactly what you find. So, it’s not a surprise that they get it wrong every time. The Fed has a one year forecast that they do every year. It’s one year forward. So, in 2009 they’ll forecast 2010. And 2010, they’ll forecast 2011 and so forth. If you look at the last four years, they’ve been wrong every year by orders of magnitude – not just a little bit wrong, but completely wrong. [They forecast will] say 3.5 percent, it comes it at 2.4. It’ll say 3 percent. It comes in at 1.9. Those are big errors, big orders of magnitude in something like forecasting GDP, which is only ever going to go between something like negative 3 and plus 6, and it’s not a wide range. So, if you go back to 2007, just look at [former Fed Chairman Ben] Bernanke’s own words taken from the minutes of the FOMC [Federal Open Market Committee] meeting where first he says the housing crisis will blow over. As late as 2008 they didn’t understand the magnitude of it. They underestimated the duration of it. Once they got a couple of years into it, they began to appreciate the duration, but they were still applying the wrong policy because this is a structural problem. We’re in a depression that began in 2007 and will continue indefinitely. And they’re applying a liquidity or cyclical solution. You can’t solve a structural problem with a cyclical solution. You need a structural solution. So they’re still applying to wrong medicine. So, I would say the biggest problem in the world today in finance and economics is that the people in charge are using the wrong paradigm, the wrong understanding of how the world works, the wrong models, and they are applying the wrong medicine and we’re going to get disastrous results. Q: Your book suggests there seem to be so many forces in play that the system has reached criticality. That is, things have become so critical that almost anything could set off a crisis or meltdown. If policy makers were on top of this, what should they be doing? A: Well, that’s a very good question. They should be doing a lot of things, some of which in the short run would be painful, which is one reason they don’t do them. Your description of what I’m writing is actually a very succinct way to put it. The system is actually reaching criticality – what can you do about that? Well, the first thing they can do is to back away from it. Raise interest rates. Begin to reward savers instead of punishing savers. Begin moving to more of a savings and investment kind of model rather than a borrowing and debt and consumption driven model. And reverse QE as fast as they can and not just reduce purchases as they are doing now. They’re still printing money. They’re just printing at a slower pace. They should actually get rid of some money and take it out of the system by reversing QE. Then they should normalize interest rates. Normalize the balance sheet and then say to the Congress, hey, look, this is not something that we the Fed can solve. Money printing does not create jobs. Cyclical programs don’t solve structural problems. You, the Congress please do your job and [come up with] actual structural solutions. You say what are those? It would be a basket of things involving fiscal policy, labor policy, labor mobility, various cost uncertainties that are being imposed on the economy, the Keystone pipeline. There’s a long list of things to do there. Q: You talk about de-scaling the complex system to reduce risk and uncertainty. Rickards: You need to break up the system. I know I use the [single snow flake causing an] avalanche metaphor but I try to make the point that it’s more than a metaphor. The dynamics and the math are actually the same, just in a different phenomenological space. So what does the ski patrol do when you see snow building up and it’s going to cause an avalanche and kill some skiers? Well, they explode dynamite. They fire a cannon into it or throw some explosives and a charge and they break it up at a time when no one is skiing below and make it harmless and then after that the skiers can enjoy the skiing. As applied to banks, that would mean breaking up the banks. Just take JPMorgan for Exhibit A and break it into five banks. It used to be when I started in banking that what is today JPMorgan was five different banks. It was Manufacturers Hanover, Chemical, the old J. P. Morgan, Chase Manhattan and Wachovia. This is not nostalgia on my part. This is what you would do prevent collapse and then you could say, hey, if one of these five banks were to fail, that might be a little painful but it’s not going to take down the system. Put them all together. They whole thing fails and obviously it does and then the government has to intervene and that just means more intervention and more distortion and then the whole thing just gets worse. Q: You criticize the widespread use of derivatives by banks that are too big to fail. Rickards: I would ban most derivatives, not all of them. I think exchange-traded futures, and a few tests having to do with transparency, good risk management and good collateral management [are OK]. The Chicago future exchanges have 150 plus years track record of doing things right. I think we can have some confidence in those. But, over-the-counter swaps and derivatives that are off the balance sheet of the books of the banks that don’t have good capital, I would ban most of those. So the combination of breaking up the big banks and banning most derivatives and increasing capital requirements – those three things taken together would be the equivalent of exploding some dynamite that isn’t dangerous now and preventing the avalanche danger. These are all ways of descaling the system. It’s not that there won’t be failure anywhere. It’s just that it won’t be systemic. Q: I noticed that you also called for reinstating the Glass-Steagall Act, particularly provisions in the 1933 law that separates investment banking from commercial banking by deposit-taking institutions that was repealed in 1999 the Gramm-Leach-Bliley Act. Would separating those business into separate companies add another layer of protection for the financial system? Rickards: Yes. Absolutely. When I say these [like bring back the Glass-Steagall Act,] I like to put some science, some data or analytics behind them so they don’t come off as political rants because I’m not that political and I try not to be a ranter. But take the whole history – the pre-history, the history and the post-history of Glass Steagall. What happened? Well, in the 1920s banks in the United States discovered they could create garbage products and sell them to their customers and essentially fleece the customers. And that collapsed in a pyramid and the stock market crashed and [we had] the aftermath of 1929. So, in 1933 the Congress had hearings and said our job is to protect the public, so let’s find out what happened. And they had hearings and they reached a conclusion that there were inherent conflicts of interest[between taking deposits and lending, on one hand, and investment banking, on the other]. So, they said, OK, this is simple. From now on you can take deposits and make loans. That’s fine and you’ll be regulated. Or, you can underwrite and sell securities. And that’s fine. But you can’t do both. It’s a conflict of interest to take depositor money off the street of basically from people who trust you and then use that to speculate in the securities market and use your franchise or store window to sell garbage to customers. You can’t do that. Well, that was Glass-Steagall in a nutshell. That was the law for 65 years until 1999 and in the entire 65-year period we did not have any systemic crises of the kind we saw in 2008. We’d have to go back to 1929 and before that to 1907 to find this type of crisis and then all the way forward to 2008 to find it – and in between we didn’t [systemic crises]. Now, we did have bank failures. Some of the were pretty big. We had Penn Square. We had Continental Illinois. We had problems in the banking system, the [savings and loan] crisis of the 1980s, which cost about $200 billion in real terms in today’s money to clean up. So, I’m not saying it was trouble free but we never had anything like the systemic risk or TARP. Now, come forward to 1999, Congress repealed Glass-Steagall. And then they repealed swaps regulation in 2000 [when they passed the Commodity Futures Modernization Act]. So what happens? Within years [of repealing Glass-Steagall] the banks originated garbage products and started selling them to their customers. So is that any surprise that eight years later we have a massive systemic crisis that almost destroyed the banking system? In other words, the minute you took the guard rails off the banks, they went right back to doing what they were doing in the 1920s, which should come as no surprise because they’re greedy and there are inherent conflicts of interest and once you take the guard rails off. And so, it’s almost as if the Congress in 1999 thought they were smarter than the Congress of 1933. But they weren’t. The Congress of 1933 had just lived through a disaster and they wanted to do something about it. And they did something that worked for 65 years. Why on earth would you repeal it? Why on earth would you think you’re smarter than the people who had first hand experience with it and came up with a solution? So, yeah, put Glass-Steagall back on as soon as possible. That is also consistent with the idea of doing what I call de-scaling, which is what physicists would describe as what you are doing to the system. Break the system into smaller parts so that a failure of any part does not threaten the system as a whole. That’s the basic idea. Glass-Steagall does that. Breaking up the banks does that. Reducing derivatives does that. It all feeds in. James G. Rickards is a lawyer, economist and investment banker with 35 years of experience in capital markets on Wall Street. His new book The Death of Money, published by the Penguin Group, is a New York Times bestseller. His first book, Currency Wars, published in 2011, and was also a Times bestseller. In his new book, he explores further the consequences of the weak dollar policy pursued by the Federal Reserve Bank, coupled with the huge run up in deficits and debt by the United States, and the failure of Congress and the Obama Administration to devise policies that would spur faster economic growth. Rickards is a portfolio manager at West Shore Group, LLC, Haddonfield, N.J., an investment fund set up in 2013, and an adviser on international economics and financial threats to the Department of Defense and the U.S. intelligence community. He gained first-hand experience on the front lines of a financial crisis as counsel for the hedge fund Long-Term Capital Management, when he was principal negotiator in the 1998 bailout of the fund by the Federal Reserve Bank of New York. Q: Another thing I found intriguing in your book is the discussion of how gold prices have been manipulated to keep the price low to facilitate a stealth rebalancing of gold reserves from the west to the east, especially China. Obviously the central bankers know about this. How could they not? The price manipulation has been done by selling numerous paper investments backed by same stash of gold in unallocated and leased sales. Could you explain how underlying stresses in the system could lead to a gold buying panic? When you look at the Chinese, they have a closed capital account so [the Chinese people] can’t buy stocks and bonds [outside of China]. The Shanghai stock market is a bit dismal. The real estate is the thing that’s going to collapse. And the banks pay them 25 basis points on savings. So you look around and say what the heck can I buy that will preserve wealth? And the answer is gold. And this is beginning already in certain ways but it will accelerate. So when this crash comes, it’s again a demand shock and that’s exactly right. Now, China’s problem is they have the fastest growing economy in the world. Even with the problems and even with the slowdown it’s still the fastest growing economy in the world as a percent of global GDP. So, think about the right reserve mix of gold at the market price as a percentage of GDP, which is what I talk about in the book. It’s in that Chapter 9 [“Gold Redux”] and Chapter 11 [“Maelstrom”]. If you think about it, China is a moving target. No matter how much gold they buy, they have to keep buying more, first of all to reach the same ratio as the United States and they are not quite there yet – and then to maintain it because their economy is growing faster than the United States. That means they are going to buy more gold just to keep the ratio the same. If you combine that with a rising price, all of sudden the price goes to $2,000, $2,500, $3,000 et cetera, this gets to be out of reach. I’ve got a moving target in the quantity. Now I’ve got a moving target in the price. Things are getting away from me. Things become more transparent as the buying power [decreases] so China might not ever got there. So dynamically they have to keep the lid on the price until the rebalancing is done. Then, at the point it doesn’t matter. So wherever the price goes, China’s on the bus. This is all about making sure China’s on the bus. Q: What about all the paper gold? What role does that play? Rickards: The leasing and the unallocated gold, and the paper gold and the gold futures and all that, those are the tools for price depression. By the way I don’t believe or I’ve certainly not seen any evidence that major banks are taking position risks to make this happen. They are just intermediaries. They are making spread. They are charging commissions. They are doing what the customer wants but the customer happens to be the BIS (Bank for International Settlements]. And it’s mentioned in the book and documented in the footnotes from BIS financial statements that they do transact with banks and central banks and commercial operations in gold leasing operations. So, if the customer happens to be the BIS, you are going to do what the customer wants. So it’s coming from the central banks [who created the BIS and are its constituency]. So, that’s the price depression [of gold]. And, by the way there’s more and more statistical evidence coming out. And I’m sure you heard about the study at Stern School of Business at NYU [New York University]. [The authors of the draft research paper are Rosa Abrantes-Metz of New York University and Albert Metz, a managing director at Moody’s Investors Service.] I haven’t seen it because it’s not published yet, but I’ve seen some excerpts and synopsis that indicates that there’s powerful statistical evidence that gold is being manipulated. I’ve also spoken to another guy, a Ph.D. statistician for a major billion-dollar hedge fund and who is not a gold bug. He did the work and reached the same conclusion [the gold prices are being manipulated]. He did a 10-year price study of [changes in gold prices] on Comex [the Commodity Exchange, a division of the New York Mercantile Exchange] during trading hours versus after hours. When you’re talking about markets and statistics, those two accounts should be the same. But the answer was they weren’t anywhere near the same. The Comex [during working hours] actually performed dismally and the after hours account did multiples what actual gold did. There’s no explanation for that other than the manipulation of the Comex. And he agreed with me that is the right conclusion. So the evidence is everywhere [of manipulation of gold prices] and it’s all designed to keep the price of gold low until China gets the gold they need to be on the bus and you kind of go from there. What has been surprising is that utter nonchalance of the U.S. government. Because I’ve gone down to senior officials in the Pentagon, the intelligence community and the Treasury and elsewhere and in Washington with a little bit of alarm saying, hey, do you know what the Chinese are doing? Do you see what’s going on here? The reaction is they are either completely non-plussed or they were unaware of it or they are aware of and they don’t see why it’s such a big deal. But let me explain why it is a big deal – not for just geopolitical geostrategic reason I just mentioned, but in terms of the technical set up for where gold is going to go from here. If you think of stocks and flows in round numbers there are about 35,000 tonnes of official gold in the world and about 177,000 tonnes of total gold. And mining output is quite small. All the mining in the world increases the total stock by about a little over one percent a year. So, it’s a factor but it’s not a big factor. So when 500 metric tonnes of gold moves from a GLD warehouse to China’s government vaults in Shanghai – which it did last year, by almost a straight line with a stop in Switzerland just to get re-refined. But, when gold does that, a lot of analysts look at that and say, well, so what? It was in a vault in London. Now it’s in a vault in Shanghai. They just turned it from a 400-ounce bar to a kilo bar. Whatever. It’s the same gold. It moved from one vault to another. Who cares? And that’s kind of where the national alarm comes from. But here’s the difference. When gold moves from the GLD warehouse to the government vault in Shanghai, there is no change in the total supply, but there is a diminution in the floating supply. The floating supply is that portion of the total stock that’s available for trading. So, if I’m in GLD or I’m in a bullion bank and I’m a UBS, that gold is available for the kind of paper trading we just talked about. But if you put it in private storage, you put in a Chinese government vault, it’s not available for paper trading. It’s just gold being put away. Well, that’s exactly what’s going on. If you think of the gold market as an inverted pyramid, and on the bottom there are a couple of bricks of gold. And then in the inverted pyramid on the top you have all the paper gold. So, it would be leasing, unallocated sales, Comex futures which totals up to 100 to 1 [paper claims against each a portion of physical gold]. That’s OK. That’s not unlike other derivatives markets. But if you start pulling the gold bricks, the gold out from the bottom you’re going to topple the pyramid. At least you’re going to force that pyramid to shrink. And that’s what’s going on. Total gold supply is not changing. The floating supply is changing. And that means less gold to support the paper trading. And that means one of two things is going to happen. If you keep the paper trading just as big, you are going to destabilize it. If you shrink it, it’s going to increase the price of gold. Either way we’re in for some interesting times. Q: Does Washington recognize that China is trying to assure its place in any future international monetary system by acquiring this gold? Do they at least recognize that? Rickards: The only really top-level official I’m spoken to who does recognize that and thinks it’s fine is Min Zhu, deputy director at the IMF. I’ve spoken with him and he says that just makes sense to him. By extension it makes sense to the IMF. Because he used a phrase – I was shocked to hear him say it – they make a distinction between what they call credit reserves and real reserves. That is exactly the right way to put it [meaning paper money is considered credit reserves, a claim on the central bank standing behind it]. But I was shocked to hear anyone say it; because who thinks that paper money is credit reserves? I do. But I’m not sure many other analysts do. Min Zhu said clearly China is, in effect – and these aren’t his exact worlds – is overweight paper and underweight gold. And so they ought to get some gold. So he could see it for what it was and he thought it made a lot of sense. Why does it matter – unless we’re somehow going rewrite rules of the game and gold plays a role? Because if we weren’t going to do that and gold didn’t play a role, then it wouldn’t matter. But Min Zhu clearly thinks it does. Now, on the U.S. government side, people in the Pentagon are interested [in what’s happening with China’s accumulation of gold and what it might represent], but they feel constrained in what they can do because they don’t want to mess with Treasury. And that’s the other thing people don’t understand. The think of the U.S. government as a monolith with a single point of view and nothing could be further from the truth. The U.S. government is an octopus with eight legs and every leg is dancing to a different tune. And so, the Pentagon is kind of concerned but they feel they can’t really say anything because that’s the Treasury’s job. Over at the Treasury I’ve spoken to a number of people there. The risk people there, it doesn’t even factor in, that’s the kind of thing we were talking about earlier. Well, the Fed, it’s just not in their mental frame. [I am not sure where key current and former top Treasury officials stand,] people like Lael Brainard, [the former Under Secretary of the Treasury for International Affairs] or Secretary [Jack] Lew. [As for former Treasury] Secretary [Timothy] Geithner, well he is an IMF guy. His training, his experience, is all in the areas we’re talking about. I haven’t spoken with him. I can’t read his mind, but I have some difficulty believing he doesn’t understand it and doesn’t somehow approve [China’s accumulation of significant gold reserves]. Certainly, the U.S. is in a position to stop it and we’re not stopping it. So, somehow, at least in principle he must think it’s OK.
Q: I guess the point of all of this is that if the dollar is in a crisis and some of the scenarios unfold that you talk about in Chapter 11 [“Maelstrom”], then China is going to have a say in the design of the next international monetary system that emerges and they don’t want the dollar as the world’s leading reserve currency. Rickards: They will now [have a say]. I don’t think that was true four or five years ago. It’s definitely becoming true and I think that’s what’s going on. That’s exactly what’s going on. By the way, there was a secret meeting in Washington [Sunday, April 12] that was a dry run for Bretton Woods. [The town of Bretton Woods, New Hampshire, was the site for a July 1944 United Nations Monetary and Financial Conference of delegates from 44 nations. They met to jointly design and sign an agreement to establish a post-war international monetary system with the dollar, backed-by gold, as the centerpiece of the new order.] Friday and Saturday [April 10 and 11, 2014] was the IMF spring meeting. And these finance ministers and central bankers from all over the world were there. And when they get together they do all these things. They do G20 on the sideline. They do BRICS on the sidelines And there all these get-togethers. Well, on Sunday [April 12, IMF Managing Director Christine] Lagarde hosted a meeting and the head of the Bank for International Settlement was there and the head of the Swiss National Bank was there. And of course senior IMF officials were there. And then, this is all in a press release [issued the next day by the IMF http://www.imf.org/external/np/sec/pr/2014/pr14170.htm that reports there were] a number of other prominent economists and officials were there. But, they didn’t disclose the names. But clearly a mix of senior national monetary officials and senior bankers and private economist and academics at a meeting behind closed doors to discuss the future of the international system. The title of the seminar was “Monetary Policy in the New Normal.” What will the rules of the game be once we get into the post crisis period? Of course I’m the one saying we’re not going to get to the post-crisis period because we’ve got all the wrong policies. But, be that as it may, that’s what they were doing. So, it looks like it was a one-day practice round for a new Bretton Woods. Q: Now, looking at the scenarios you point out in Chapter 11 [“Maelstrom”], it appears that most likely candidate to become the centerpiece and central reserve for a new international monetary system if the dollar collapses is something called Special Drawing Rights or SDRs issued by the International Monetary Fund is the. Would the SDR be backed by gold? Rickards: I don’t think they want it to be backed by gold. I don’t think there’s a central banker in the world who wants gold-backed money. But, the point I make is that they may have to. They may have no choice. If people have lost confidence in paper money, such as the dollar, why should they have any more confidence in the paper SDRs? [On the other hand,] they might [have confidence in SDR as a paper currency] for two reasons. Number one. No one understands it. I’ve spoken to international economists who don’t understand SDR. Certainly mainstream economists and market analysts certainly don’t understand it. Everyday Americans or citizens around the world don’t understand it. Why should they? It’s a very technical subject. I’ve met experts who don’t understand it. So you might be able to get away with it because nobody knows what it is. The inflation [in local currencies tied to the SDR] would show up the grocery store, at the gas pump, but nobody would know where it’s coming from. They would say oh, those guys at the IMF they’re crazy, you know. Good luck figuring out who they are – a bunch of Communists and dictators and kings. Its unaccountable, unelected super-elite who meet behind closed doors. No one knows what SDRs are. This is the stuff that infuriates me. This is world money but they don’t want to call it that. So they call it special drawing rights. Is there anything more anodyne and bureaucratic [a name for money] that you can think of? I can’t. They do this stuff on purpose for exactly the reason they don’t want people to understand it. So it might work in the short run on that basis. And, it might not. Gold is sort of what I call Plan B. If you go to Plan B, the United States has enough gold. Europe has enough gold. China doesn’t. And so China has to get their gold in case we go to Plan B. And even if we don’t go to Plan B, just when you sit down at the table to come up with a new system, even if you don’t use the gold standard, your gold is going to be your chips [as you bargain and negotiate the design of a new system]. Think of it as a poker game, you want a big pile of chips. And the guys with a little chips -- they’re going to go to the little table. And the guys with a lot of chips are going to sit at the big table. And China of course, needs a seat at the big table because they’re the second largest economy in the world. 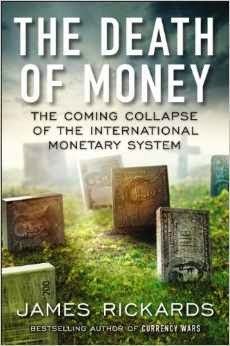 Q: One of the scenarios you lay out after the crash of the dollar and the international monetary system is that the dollar would survive the crash and again by the lead reserve currency because officials decided to back it with gold. If that happened, you estimate the dollar price of gold would be set at $9,000 an ounce. Rickards: I quote the value of the dollar in a future international monetary system and by the way $9,000 is the right price. That has all kinds of consequences. How likely is that scenario? People say now wait a second, Jim. You said $7,000 in your first book Currency Wars. Now you’re saying $9,000. What happened? So, the answer is they printed another trillion dollars [since the first book.] I don’t make these numbers up. I use actual data. And it’s a very simple ratio of physical gold at market prices to paper money. It’s eighth grade math. It’s not difficult. So, if you change the inputs, you change the outputs. If you print more money you get a higher price. Now, here’s what the number means. Again I’ll emphasize that there are analytics behind this. These are not just provocative numbers designed to get a headline. It actually comes from some place. Here’s what the number means. That’s the implied non-deflationary price. And what that means is that we don’t have to have a gold standard but if we do, you have to pick a price and you better get it right because if you get it wrong you can actually make things worse and create a super depression. This is what happened in the 1920s. From 1870 until 1914 the world had a very successful gold standard, the classic gold standard. In 1914 they abandoned that because they knew they had to print money and borrow money to fight World War I. So when World War I was over there was actually a period of turmoil. In 1919 and 1920 you had deflation and hyperinflation going on side by side. There was extreme inflation in the United States in 1919 and then we had the depression in 1920. And then you had hyperinflation in Weimar Germany in 1922. This is a period of enormous turmoil in the international monetary system and of course there wasn’t a gold standard. So in 1922 there was an international monetary conference in Genoa, Italy, and the major powers agreed to go back to a gold standard. But, it was a very bastardized form of gold standard called the gold exchange standard. Q: So, what was the problem with a gold exchange standard? Rickards: Here’s the problem. Having abandoned [the gold standard] in 1914 at a certain parity and having printed enormous amounts of money to fight World War I, and now deciding in 1922 to go back to the gold standard, what would the new price of gold be measured in your currency? Well, you sort of had two choices. You could be candid about the fact you had printed all the money and go back to a new parity where your currency is divided by half. That is one choice. And that is what France and Belgium and some others did. Or, you could back to the old parity. Because it’s always a ratio of paper money to gold. So the amount of gold is pretty much fixed, so if you doubled the amount of paper money and you want to go back to the old parity, you have to cut the money supply in half. And that’s what England did in 1925 when Winston Churchill was Chancellor of the Exchequer. Well, that meant cutting the money supply in half, which they did and which threw England into a depression three years ahead of the rest of the world. You know people kind of date the depression from 1929, but England was severely depressed in 1927 and 1928. Churchill later said that was the greatest blunder of his life because he was a good general and good statesman but not a very good economist and he understood the implications. And now come all the way forward to 2016 and 2017 and we’re at the international monetary conference and we’re basically trying to do same thing, rewrite the rules of the game. I make the point that you don’t have to have a gold standard but if you do, you better not repeat Churchill’s blunder. You better not pick a price that is so low that the implied money supply cannot finance gold trade and world commerce without causing a depression. So, the question is what is the right price? And the answer is $9,000 an ounce. Q: Now, if the United States wants to avoid losing its leading role in the world monetary system, you indicate it could do so by returning to a set of strict monetary policy rules like those put into place in the 1980s, when Paul Volcker was chairman of the Fed and the Reagan Administration pursued a King Dollar strategy. If such policies were put in place, you say that could preserve the role of the dollar. Rickards: Correct. Those rules had to do with what is a sustainable budget deficit and what is a sustainable debt load. And when I say sustainable I mean based on your debt and deficits, your total debt-to-GDP ratio and your ongoing deficits, what set of conditions is the market will to go along with you? OK, you’ve got a lot of debt and you’re running deficits, but your economy is such that we believe you are now on a sustainable path and we will continue to buy your bonds. And what I talk about in Chapter 7 [“Debts, Deficits and the Dollars”] are the formulas for that. And the theory if you stay within those boundaries, you don’t need a gold standard and you’re not facing a sovereign debt crisis and you might not be facing a currency collapse. You can kind of keep going. So that’s what I really talked about and I outlined those metrics. The problem for the United States is that despite all the happy talk from Washington, we are continuing to go down the path to Greece. Now in the last year, year and a half there’s a lot of self-congratulations in Washington because we’ve cut the budget deficit in half, which is true. The budget deficit in round numbers has gone from about $1.4 trillion to about $700 billion in two years. That is true. But the debt to GDP ratio is still going up. It is still going up because even if you bring the deficit down from 8 percent to 4 percent of GDP, if your GDP is only growing at 2 percent, you’re still making the debt-to-GDP ratio worse even though you cut the budget deficit. So, the budget deficit cannot be thought of in isolation as an absolute number. You have to think of it relative to the economy. And since economic growth is weak, cutting the deficit isn’t enough. And I’m asked if that means you have to cut the deficit further and I say you have to either cut the deficit further or you have to figure out a way to grow your economy. That’s where the austerity structural change that Europe is going through comes in. Europe is doing everything right. It’s been painful but they’re restructuring things in ways that will be sustainable, all under the direction of Angela Merkel and that’s what I talked about in Chapter 5 (“The New German Reich”). But the U.S. is not doing that. So, we’re still driving the bus off the cliff. We’re just going a little bit slower. Q: Seeing how well Europe has handled its crisis and the sustainable path they have chosen and the amount of gold they have – which is the highest gold to GDP ratio among regions of the world – why would Europe and the euro not become the leading reserve currency in a new monetary system? Rickards: Well, it might and I can’t rule it out. And to put a finer point on that, there’s one big thing standing in the way right now and it may go away in a few years and then the euro might play that role. But here’s the impediment. This has to do with the difference between a reserve currency and a trade reserve currency. You hear a lot of talk about the Chinese yuan. They are doing bilateral deals with Brazil and they’re opening up a yuan bond market, doing all these things deals around the world, doing deals with us, opening the capital account in small stages, widening the trade deficit. All that has to do with making the yuan a trade currency. But being a reserve currency is different. To be a reserve currency you have to have a very wide pool of investable assets. Because what are reserves? Reserves are just a savings account for countries. So, we make a certain amount of money and we spend some of it and we have some left over. Those are our savings. And we put them in the bank and maybe buy some stocks or whatever. It’s no different for a country. If you export and import and you export more than you import, and you have capital inflows, you end up with savings and that’s what your reserves are. You have to invest them in something. When they’re $4 trillion, as in the case of China, or a $1 trillion plus for a country like Taiwan, Korea and others, you need a really big pool of assets [in which to invest]. You can’t buy $4 trillion of Australian bonds. I don’t think all capital markets in Australia are close to that. So you can’t buy stuff like that beyond a certain amount. So, what’s standing in the way of Europe? Well, the Eurozone as a whole is bigger than the United States in terms of population and I think the economy is slightly smaller but it’s on a par. But the sovereign bond market is chopped up. You’ve got Italian bonds, French bonds, German bonds, etc. Now, imagine all those countries had a bond market where every bond was backed by the full faith and credit of the entire Eurozone. That would be comparable to the U.S. Treasury market and that’s what they mean to do. And then at the point you’d want euros because then at the point the bond market would be big enough. Right now it’s not. I mean, the Italian bond market is the biggest of the bunch but even it is not big enough for the kind of capital flows we’re talking about. And, you’re concentrating risk. You’re taking concentrated Italian sovereign risk. Or Spanish sovereign risk – exactly what the whole European sovereign debt crisis was about from 2010 to 2012. But if you unify and back it by the full faith and credit of the entire Eurozone, now you’re talking. Now they’re trying to do that. But Merkel won’t let that happen until all the fiscal costs have gone through. She doesn’t want to write a blank check. So she’s holding that as a carrot to the stick. The unified credit backed by the full faith and credit of the Eurozone, which is basically Germany, is the carrot. But the stick is get your fiscal house in order. But they’re doing that. They’ve signed a fiscal treaty. They’re monitoring it coming out of Brussels and the IMF. They now have unified banking regulation. They’re going to have unified deposit insurance. They’re doing a lot of things in steps. But they’re still a few years away. No one knows exactly. But my estimate is that they are at least three years away. They may be a little longer before they can have a unified European sovereign debt market. So that’s what’s standing in the way [of being able to have the euro as take a greater role as a reserve currency]. But if they got there, and the system doesn’t collapse in the next five years, and Europe goes to a unified sovereign bond market backed by the full faith and credit of the entire Eurozone, at the point you do have a viable alternative to the Treasury market. And I would expect the European component of the reserves to go up significantly and the dollar would go down. On CNBC's Morning Show, Squawk Box, Andrew Ross Sworkin's prior day interview with Michael Bloomberg is excerpted, May 2, 2014.
yesterday i sat down and spoke with michael bloomberg as part of our 25 list. most impressive individuals over the last 25 years in business. what he thinks about the controversy over high frequency trading. i think there are too many events that have taken place where clearly people were breaking the law, where people were not looking out for their customers's best interests, where there was corruption scandal, theft, whatever. but generally speaking, in the aggregate, people that work on wall street are as good as people that work anyplace else. if it wasn't for wall street, commercial banks, investment banks, we would not have an economy. the average person that works on wall street makes $70,000 a year and lives on main street and shops on main street. we are all in this together. and i think most of these where we pile on and blame the ceo for some of these things, in retrospect i'm sure they look back and say i wish i had caught that thing before somebody was taking advantage of us or just doing something wrong. but the organizations are very big. the world is phenomenally complex today. and you can say, well, we have to simplify it. you can't. what do you make of the larger debate about in equality and capitalism as a businessman. one of the things you're seeing is the effect of the federal reserve pumping a lot of money into the system. i don't know whether it's created a lot of jobs. it's probably created some but not a dramatic number. but what it has done is it has inflated asset values. assets are held by the average person through their pension fund or the wealthy because they have the money to own assets. and so that has exacerbated the rich/poor top 20%, bottom 20% gap. the issue here is what do you do about it? and taking it away from the top and giving it to the bottom has been shown in history to not be -- think of the ussr. thatst does not work. you have to the make a fundamental decision, do you think it should be equal opportunity for everybody or equal results in and that's really the difference between those that the populus who think it should be equal reports. or those that think, you know, there's some luck involved in everything. but you dealt a set of cards. you have to play them. sometimes you win. sometimes you lose. but at least you are in charge of your own destiny. one of the things bloomberg lp did so many is bring transparently cy to the market. yes. what do you make about high frequency trading and the argument that the system is rigged. there is always abuse. the system isn't rigged. somebody is hacking into the computer system right now. somebody else is trying to trade given an edge on trading, that sort of thing. the world should be measured the following way. the commissions charge to do a transaction are so dramatically stronger today they are measures in thousands of a penny sometimes compared when i was in the securities business in 1966 on a $50 trade. $1.50 commission spread. and that's all gone. the public is better served by it. and if you want to make sure you get the best price today, if you want to, for example, sell 1,000 shares of ibm, there are 30 different changes in dark pools that list ibm. only a computer can do that. i would think you might be against dark pools given the transparency. no? no. you don't have to trade that there. you as an investor don't have to tell everybody what you want to do. if somebody comes to me with a bid, maybe i will hit it. maybe i won't. the other person doesn't have the right to know that. if you are making an offer, you should make it to everyone. dark pools you come in and say i want to do something and see if the other side is there.